In the second standalone Marisa Adair adventure, fantasy and reality clash when the members of an online group meet in person. Behind the glitter of the profiles, true identities entwine with deadly secrets. "You can't tell him." Sarah's pretty face hardens, the dimples fading like a whimsical daydream. Her fingers claw Marisa's arm. Marisa is furious. "I won't let you get away with it. You're trying to trick my friend into a relationship." Her gaze rakes the bulky sweatshirt and boxy jeans camouflaging the lush figure. "You're a stripper with a volatile boyfriend. You're not a high school teacher looking for love." To solve the murder, Marisa joins forces with unlikely allies. Parvis, an attractive investigative reporter, will do anything for a story to shock his online followers. Handsome accountant Alex is accustomed to saving money and cutting expenses. Now he's focused on helping Marisa save lives and cut off a desperate murderer. Clara, a retired lunch lady fearless to the point of foolhardiness, uses her own version of "slay-dar" to hunt the murderer. Marisa's feline friend leaps into the fray. 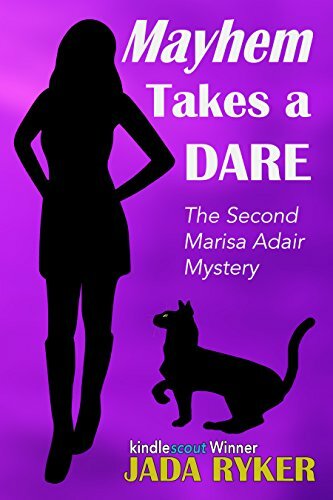 Laithe is the part-Abyssinian cat who uses his wedge-shaped head and nose for trouble to force his furry way into Marisa's investigations.